George H.W. 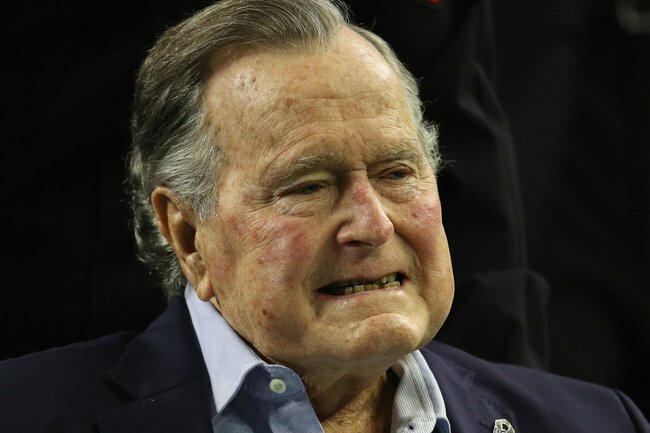 Bush cause of death: Former US President passes. Former United States president George H. W. Bush has died, age 94. Bush, the 41st president of the United States, lived longer than any of his predecessors. His death was announced in a statement issued by longtime spokesman Jim McGrath. He was US president from 1988 to 1993, and visited Australia in 1991 when Bob Hawke was prime minister. His son George W Bush was president from 2001 to 2009, and another son Jeb was Florida governor. He passed away at 10:10 pm this evening. Bush had been suffering from vascular Parkinsonism, a stroke-related illness similar to Parkinson’s disease. His wife Barbara, 73, passed away in April this year. George H.W. Bush was a patrician New Englander whose presidency soared with the coalition victory over Iraq in Kuwait, but then plummeted in the throes of a weak economy that led voters to turn him out of office after a single term. The World War II hero, who also presided during the collapse of the Soviet Union and the final months of the Cold War, died late on Friday night, said family spokesman Jim McGrath. The son of a senator and father of a president, Bush was the man with the golden resume who rose through the political ranks: from congressman to UN ambassador, Republican Party chairman to envoy to China, CIA director to two-term vice president under the hugely popular Ronald Reagan. He lost his bid for re-election to Bill Clinton in a campaign in which businessman H. Ross Perot took almost 19 per cent of the vote as an independent candidate. Still, he lived to see his son, George W., twice elected to the presidency – only the second father-and-son chief executives, following John Adams and John Quincy Adams. Once out of office, Bush was content to remain on the sidelines, except for an occasional speech or paid appearance and visits abroad. He later teamed with Clinton to raise tens of millions of dollars for victims of a 2004 tsunami in the Indian Ocean and Hurricane Katrina, which swamped New Orleans and the Gulf Coast in 2005. He became the patriarch of one of the US’s most prominent political families. In addition to George W. becoming president, another son, Jeb, was elected Florida governor in 1998 and made an unsuccessful run for the GOP presidential nomination in 2016.